21 Missions Agave, Adam's 100% Mangosteen, Allie's Edibles, B & R Farms, Bo's Best, Elaine's Toffee, Fall River Wild Rice, Fudge Is My Life, Malibu SmokinGarlic, Mrs. A's Salsa Buena, My Sister's Caramels, Robert Lambert, Russo's, Shelley's Biscotti, Terra Sonoma, The Occasional Gourmet, and Vignette Soda. Denise O'Keefe offered samples of Bo's Best Pancakes. The San Francisco Wine Competition has grown to become the largest and most prestigious competition for American wines in the world. Over 400 medal-winning wines were served at this sold-out event. The marketplace environment created at this year’s event featured samples from over 40 SavorCalifornia.com Marketing Partners. 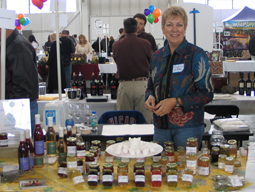 Susan McRae is ready for the samplers and buyers with her California Lavender jellies and syrups. The Marketplace attracted food lovers from throughout the Bay Area and across the nation to taste gourmet products, enjoy cooking demos, and meet chefs in a festive setting of food, wine and art. Enthusiastic tasters gather at the Savor California booth, where Allie's Edibles, Caley and Cobb, and Lodestar Olive Oil (the three that are visible), as well as Surmonté Fresh Chocolat Sauce, Vignette Wine Country Soda, Bellindora Balsamic Vinegars, Shelley’s Biscotti, La Tortilla Factory, and Sauce Goddess serve samples of their gourmet foods. Sunset's campus was transformed into a playground highlighting the best of life in the West. 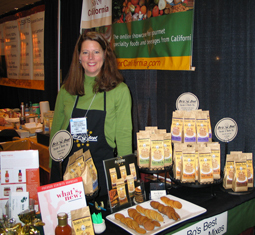 Products from Savor California were available for sampling and purchase. Event goers couldn't resist all the excitement at the Savor California booth. Chef John Paul sampled smoked duck breast from Preferred Meats and Sonoma Saveurs. Taryn suggested trying the duck with the Crazzberry Fiesta Chipotle Sauce from Art of Chipotle. And Phillip offered heart-health Corazonas tortilla chips. Dr. Toffee cured all ills with Sonoma Toffee. Patrick refreshed the crowd with non-alcoholic Vignette Wine Country Soda. Wraps from La Tortilla Factory. A group of Savor California specialty food and beverage producers were invited to participate in the spectacular Barrel Tasting & Auction. 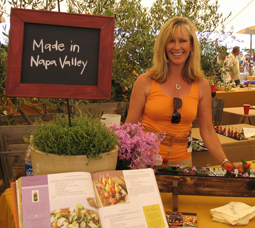 Catherine Bergen served her award winning products from Tulocay Made in Napa Valley. 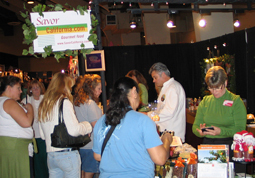 Caley & Cobb, Elaine's Toffee, Momma Reiner's Fudge, Salute Sante!, Sonoma Sparkler, Sparrow Lane, and Viva Sonoma showcased their products in the Savor California booth. 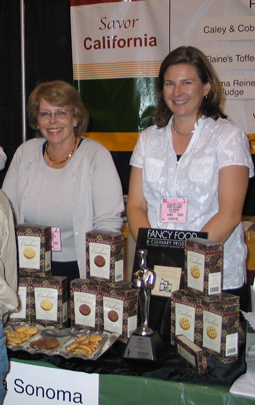 Viva Sonoma, proud winners of the prestigious silver statue, indicating that they were one of only 5 Finalists in the Outstanding Cookie category of the National Association for the Specialty Food Trade's annual competition. Savor California had a booth in the "Food Focus" section of this prestigious trade show for the gift and lifestyle market, featuring California Habanero Blends, Robert Lambert, and The Chocolate Traveler. 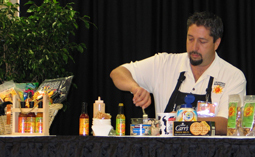 At the FoodFocus Demonstration Stage, Tim Sharkey showed the audience how to make an appetizer using California Habanero Blends' Sweet and Smokey Chipotle Sauce. This event for the food writers, restaurateurs, chefs and other food professionals, who are members of the San Francisco Professional Food Society, included the tasting and sale of specialty food products made by 20 producers on SavorCalifornia.com. 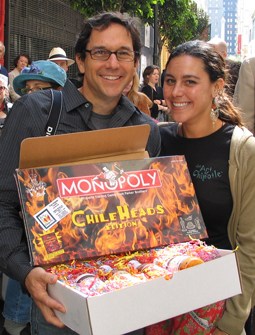 Mark McLane was delighted to win the raffle prize donated by Art of Chipotle's Taryn Pfleider -- a sampler of Art of Chipotle's Salsas and Sauces. Founded by renowned Chef Wolfgang Puck, the American Wine & Food Festival was a star-studded gathering of internationally celebrated chefs and fine wine and spirit purveyors. 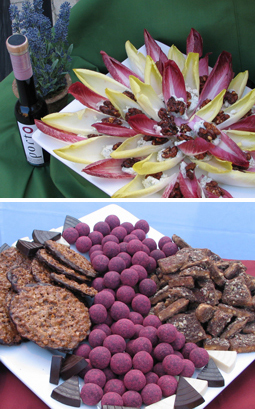 Savor California was invited to offer hors d'oeuvres and desserts using artisan products from the website and also contributed lavish gift baskets for the silent auction. At right, O Olive Oil's O Porto Vinegar, ready to be drizzled onto California Vegetable Specialties red and white endive, Pt. Reyes Farmstead Blue Cheese, and Red Barn Candied Walnuts. Also served were California Vegetable Specialties red and white endive with Cypress Grove Purple Haze Chévre, Maisie Jane's Natural Pistachios, and Wine Country Lavender Honey. Fabrique Délices Smoked Duck Breast was paired with Bellwether Carmody Cheese and Valley Fig Growers dried Mission Figs, and accompanied by Caley and Cobb Onion Confit, Robert Lambert Five-Lime Marmalade, and Made in Napa Valley Fig and Roasted Shallot Tapenade. Desserts were Shelley's Biscotti, Elaine's Toffee, Desserts on Us Laceys Cookies, Marich Confectionery Raspberry Trufflez and The Chocolate Traveler's chocolate wedges. A tasting, sampling and marketplace celebration with artisan food makers, farmers, food writers, and chefs. 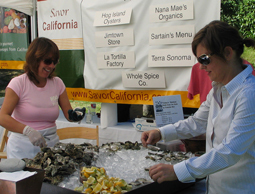 Held on the banks of the Russian River, this event featured the best gourmet food producers of the region. Naomi served Kendra a Hog Island Oyster. 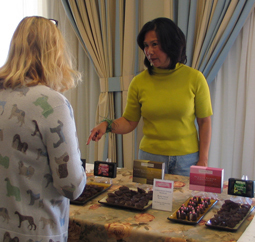 Rose Ramos-Benzel described the wine truffles and Asian fusion chocolates of L'Estaci Dolce. 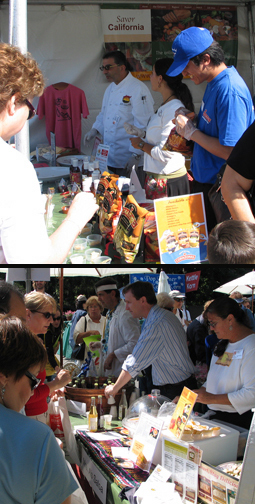 The crowds came out to sample and buy products made by Savor California businesses: Art of Chipotle, Sauce Goddess, Spindel Farms, and The Chocolate Traveler. 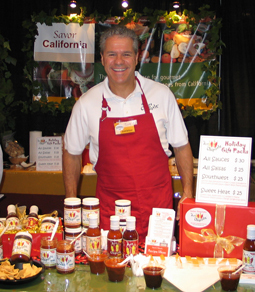 Tom Pfleider wowed 'em with the Art of Chipotle salsas. 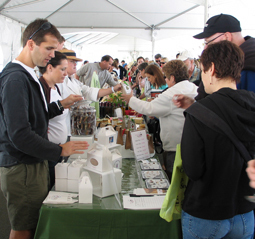 Over 300 artisans of handmade arts and crafts -- and specialty gourmet foods made by Savor California businesses: 21 Missions Agave, B & R Farms, Bo's Best Pancake Mixes, O Olive Oil, Spindel Farms, and The Chocolate Traveler.